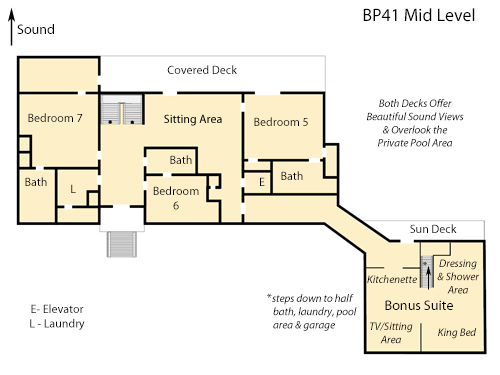 The perfect home for hosting family reunions or other special occasions, Sound Surround offers eight master bedrooms. 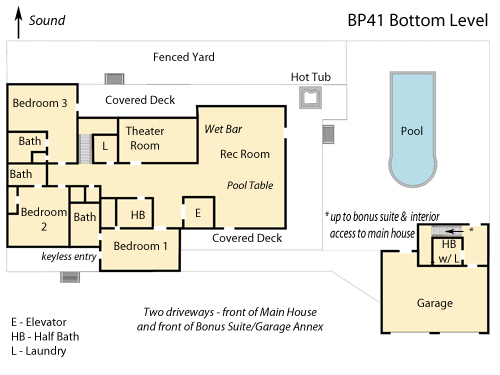 Bonus suite over the garage connects to the rest of the house via a long hallway which can be closed off, allowing for a private getaway! 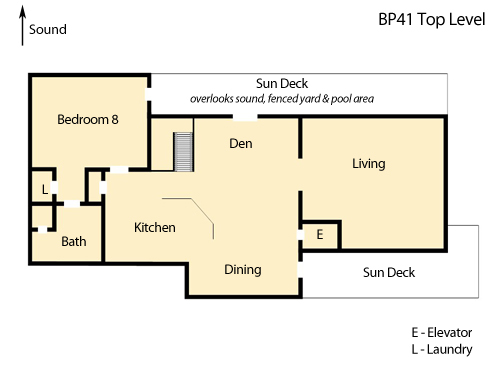 The top floor of the bonus suite is a unique loft layout, complete with your own living area, mini kitchen with refrigerator and microwave, and tiled shower (please note this is not in a separate bathroom area), and dressing area. The bottom floor of the suite contains a washer dryer, toilet and sink with a door leading to the pool area. Multiple gathering areas make this the perfect home to have fun with all the family and friends. Rec room with a wet bar, pool table and TVs, theater room with reclining seats. Free WIFI. Enjoy the private pool and hot tub with sound views and multiple decks to relax and enjoy the awesome sunsets. Many other amenities include a 35 foot canal boat slip (not directly in the back yard, but just a short walk down the road), fenced back yard, ample parking including a two car garage, two driveways, community fitness center and community pool and secure gated community. Elevator with access to all three floors of the main house. Pets are allowed and there is a no smoking policy. Ask about our Military Discount. Fireplace not available for guest use. This house was perfect for our family for Thanksgiving. Plenty of room for everyone to be together, enjoy delicious meals, and the views cant be beat. This was a great, well-equipped and maintained home. Very comfortable and the most relaxing vacation. We were disappointed with the poor WiFi reception. You had to be in the main room on the top floor to get any WiFi. Also we had to rent a gas grill because the one provided was too small. One last annoyance was the range top. Almost impossible to see the settings. But, on balance, an awesome home. Thank you for sharing it with us.